Eczema is an allergic disease with frequent relapses and skin manifestations. Eczema is a problem for the population of the entire globe. It affects not only the adult population, but also children. The starting point is often food. We would like to discuss this problem for better understanding of which foods can be triggers and which can help to prolong the remission period. Eczema may occur for many reasons. 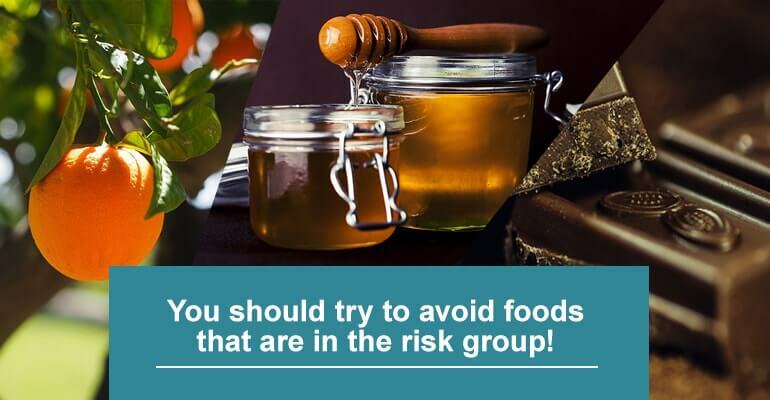 However, the leading factor is a delayed-type of an allergic reaction to certain foods. Response to those allergenic effects is suppression of cellular and humoral immunity. Immune failure plays a leading role in the development of the disease. Dysgammaglobulinemia is another disease that often accompanies eczema. This condition results in high rates of immunoglobulins IgG and IgE and immunoglobulin IgM reduction. The number of lymphocytes is reduced, causing a shift of helpers and suppressors. Those changes aggravate clinical symptoms in the form of skin manifestations, which not only have an unattractive look, but also cause discomfort in the form of rashes, itching, and possible complications. Eczema is often accompanied by other diseases affecting the gastrointestinal tract, liver, endocrine system, etc. It explains the frequent relapses and severity of the pathology. Eczema affects people of different ages.The development of eczema in young children is associated with switching from breastfeeding to another type of nutrition (introduction to new foods). According to official statistics, every 15th child under 16 years old suffers from eczema, as well as every 30th adult. Diet therapy excludes the ingestion of an allergen that causes aggravation. This measure will provide longer periods of remission. However, it is challenging to understand why skin symptoms worsen, since the diet can include a variety of foods combined with other triggers such as stress, animal hair, etc. Doctors often recommend that patients keep a food diary, where they note every product they eat, and which skin reactions occurred. This method is particularly useful when you need to find the food trigger in a child. A breastfeeding mother would write information about her diet, as well as the nutrition of the baby (if he is on formula or trying new foods). Food allergens can be identified using a screening test. However, this type of test cannot cover the full variety of risk factors. The outbreak might be caused by food that does not belong to a group with high allergenic risk. Fish that are grown in captivity. Products containing preservatives and dyes, etc. Fermented dairy (kefir, yogurt, etc. ), which regulate the intestinal flora, improving biochemical and immune processes. It is important for the product to be natural with no preservatives or colorants. Green tea has various useful properties. It contains vitamins, antioxidants, and other elements that regulate metabolic processes and immune status. Foods containing Omega-3 (fish, fish oil, etc. ).This fatty acid has beneficial effects on the body. It reduces inflammation, reducing the risk of disease recurrence. Products that are rich in vitamin E (vegetable oils, sprouted grains, etc.) help to prevent dryness, reducing the risk of skin rashes in eczema. Foods with high vitamin A content (not red fruits and vegetables, liver, fish, etc.) have a beneficial effect on the skin and help to exclude eczema skin symptoms. Turmeric is a spice that is not only used for flavor in various dishes, but also has many useful properties, especially anti-inflammatory ones. It helps with eczema outbreaks and can be used in food and locally. Apple cider vinegar contains many vitamins and elements. In the case of eczema, it helps to reduce skin itching during outbreaks. The product regulates metabolic processes, restores intestinal flora, and improves immune status. Aloe vera juice helps to remove local inflammations, and eliminate itching in the case of relapse. During remission, it improves skin condition and immunity. Aloe can be used topically and in drinks, tinctures, etc. For a better effect and quick results, you can combine diet therapy with a UVB lamp. This approach will minimize the acute period of the disease several times, providing long-term remission. Positive results are noticeable in the first two to four weeks of the procedure. As the skin condition improves, inflammatory signs disappear, and the itching stops.